Anna Feigenbaum’s Tear Gas: From the Battlefields of WWI to the Streets of Today is a poignant inquiry into the relationship between a corporate-capitalist system of governing and its implications for oppressed and resistant populations. Feigenbaum’s analysis expands the framework through which tear gas—and military policing in general—is understood, primarily by illuminating the relationship between corporate interests and social, economic, and political control. The book also discusses the meaning to social movements of the corporate relationship to the mechanisms of control. Exploring some historical analysis of the construction of this relationship will be useful for understanding Feigenbaum’s critique. Noam Chomsky often notes the establishment consensus on the differences between “special interest” and national “interest” or “security,” explaining that those who were politically unmotivated or impotent until the 60s “tried to enter the political arena in one or another way to press their interests and concerns. They’re called ‘special interests,’” composed of “minorities, young people, old people, farmers, workers, women,” or simply “the population. The population is special interests, and its task is to just watch." (The Nation, Chomsky, Lydon). With communists and leftists, these are the kinds of groups the state believes are “special interest extremists” threatening the national interest and security. Lewis Powell, 1970s corporate lawyer, famously warned the American business community in a memo that, along with the university and journalists, these are the radicals and “new leftists” threatening to “destroy the entire system, both political and economic” (The Lewis Powell Memorandum, Lewis Powell). James F. Jarboe, then FBI Domestic Terrorism Section Chief, testifying before the House Resources Committee in 2002, claimed that domestic terrorism threats stem from “special interest extremists,” namely, he noted, “the extreme fringes of animal rights, pro-life, environmental, anti-nuclear, and other movements.” Understanding American state violence must be preceded by understanding how the security and interests of the population threaten the interests and security of corporate power, and vice versa. The population is attacked and sacrificed to protect and advance corporate power. Feigenbaum’s Tear Gas is an impressive elaboration of how this dichotomy manifests itself in day to day life, a critique of concentrated corruption in American-style capitalism, by explaining who tear gas is designed, sold, and deployed by, who it is used against, and why. Feigenbaum’s analysis begins with the process by which chemical weapons became accepted in American military-policing and, more gradually, in Great Britain. Amos Fries, a 1920s American general, was a key public relations ideologue in the Chemical Warfare Services and the beginning of the public relations campaign to legitimize tear gas. Citing Fries’s reputation for his “staunch anticommunism,” openness to “military solutions for dissent both at home and abroad,” as well as his “rationalizations of colonial myth as fact” and his constant “references to white supremacy,” Feigenbaum illuminates the origins of how targets are created that are eligible to be teargassed: nonwhites, poor people, radicals. Few outside of these categories seem to arise in the history of tear gas victims. Power-dynamics, racism, classism, as well as the physical and figurative distance between the oppressor, producing and benefiting from the reproduction of violence, and the oppressed, those being violated, are crucial for perpetuating conflict and profit-making simultaneously, symbiotically. Feigenbaum also discusses how the introduction of “Blind-X Shells” tear gas to American culture in 1927 shows that the weapon is primarily effective against the nonviolent and disadvantaged. She writes, “the [Blind-X Shell] test results explicitly stated that the product would be effective against ‘unarmed individuals,’” and notes that “it was not an anomaly or an ethical mistake for police to fire upon unarmed protesters at close range in enclosed spaces. This function was embedded in the design of these tear gas weapons.” The violent design of the weapon promotes rhetoric focused on police protocol, rather than the weapon itself, by those who benefit from the usage of tear gas, one of many systemic evasions in place for the powerful. The weapons are designed to inflict overwhelming physical and psychological trauma, to provide, momentarily, the same tactical function that execution provides permanently; the weapons are designed to harm, regardless of what police protocol is designed to do, complicated further when their usage is increasingly available and encouraged. Unfortunately, police protocol is typically used to either convince the public that the weapons can be made safe or to apologize for their abuse by blaming poor training, both of which protect the weapons themselves from scrutiny. Feigenbaum, an expert in media communications, illustrates the importance of the massive public relations campaign for tear gas, its perpetuation of public mystery and secrecy around the design, protocol, and effects of tear gas, and how public relations has ensured that all mainstream discourse on the subject adhere to one narrow framework that has grown sophisticated despite its fallacies to this day: Is tear gas the most beneficial way for the corporate-state and law enforcement to maintain the disorder it creates? As long as discourse on the subject adheres to this framework, the public relations campaign will achieve moral and intellectual balancing acts in policy, rhetoric, and secret keeping until the normalcy of the argument in favor of tear gas is more powerful than the absurdity and contradictions of its content. Feigenbaum shows how the public relations strategy to normalize tear gas was created by and sustains a day to day social, political, and economic tear gas culture of violence that cannot be omitted from serious discussions of tear gas and its impacts on our lives and shared experience. Business interests determine and benefit from the production, sales, and use of riot-policing weapons, and therefore also benefit from the physically, culturally, and politically oppressive situations in which the weapons are deployed. In other words, disorder of the population must be guaranteed to protect and grow the order of the profitmaking system of the weapons produced to respond to disorder. Tear gas, in this sense, is designed to create disorder as much as or more than it is designed to contain it. The job of the public relations industry has been to create the legitimization, even demand, for such disorder, as well as to use this legitimacy to paint victims as perpetrators and the business community and police as the victims. Illuminating the pervasiveness of a market-dominated society on a culture of violence and war, Feigenbaum continues, noting that since the years of Amos Fries, “public safety has become ever more dictated by business models for risk and security. Economic interests and the pursuit of private profits fuel these models. Under these conditions, the repression of political communication itself becomes a commodity.” Diverse, corrupt complications inherently arise from the vested financial and political interests in disorder of those with the most power and influence over the order-making process. Those with the most resources to find, control the presentation of, and apply information, and those with the most power to be heard, will use their resources to buy all the free speech they need to spread a public perception that protects and grows profits. In the United States, the population is ruled not primarily by force but by the slickest and smoothest talking kinds of criminals in history. American state criminal, overwhelming, everyday violence is perpetuated and sustained by the linguistic and psychological vitriol and cynicism—exemplified in tear gas public relations—of seeing and interpreting human interaction and existence only through the window of the “free market,” as well as by the physical and figurative distance between corporate criminals and those who they control and violate. The malleability of the stated or perceived intentions and outcomes of using tear gas, the convenience of built-in, mystifying contradictions, and the application of each of these in different contexts creates a systemic and long-lasting confusion in addition to the trauma induced confusion of the initial attack on the mind and body. The chaotic abuse of public communication and the violent repression and perpetuation of massive unrest do not end with a canister unleashed or a protest dispersed, and this is by design. The power of those with an economic interest in tear gas to control both the deployment of tear gas and its acceptable public interpretations—the militarization of the market itself—means, as Feigenbaum writes, a “rise in military policing of civil disturbances became deeply entangled with the boom in new riot-control technologies.” Remarking on the filtering of weapons through the military, the National Guard, down to local police forces, she notes, “Real-life riots and mass civil disobedience were the best marketing demonstrations that manufacturers could hope for” during times of political, social, and economic unrest, here in the context of the late 1960s and early 70s. Again, the logic here is clear: Protect the order of violently concentrated power, while also protecting and perpetuating the disorder of political and economic conditions created by the violence of concentrated power. In an endless business project, both consciously and unconsciously, the most brutalized and/or opposed to brutalization are the most targeted. Further, Feigenbaum notes, “The problem, from [the Garden Plot] perspective, was ‘un-American’ subversives and radicals rather than underlying social and economic inequality.” Again, Feigenbaum points here to protections of political and social order that perpetuate as much as they contain popular, mass disorder. The guardians of the social order have a political and economic interest in mass disorder—disorder for the weak and whoever simply does not appreciate the privilege of their masters. A key tactic of perpetuating and profiting off of disorder is framing protest, riots, and other communal expressions of suffering—symptoms of political and economic conflict—as themselves the causes of conflict, thus normalizing and/or creating popular demand for using violence as a means of repression. The violence of public relations and public perception is the necessary precursor to the violence public policing. Feigenbaum notes this framing tactic in her discussion of Major-General Anthony Deane-Drummond’s perception that leftists and communists seek “to gain power and destabilize society,” and thus should be teargassed, consistent with the perception that those opposing or impacted by the special interests and violence of concentrated power are to be structurally blamed for their own special interests—special interest in not being exploited. Victim blaming is used diversely throughout the public relations history of tear gas and in relation to racism as much as or more than to the criminalization of dissent. Actors like the London physician, Sir Harold Himsworth, whose “rationalist approach and determination,” coupled with his racism and classism, thwarted the “independence” of his investigation into tear gas in the late 60s, dismissing certain victim accounts in Northern Ireland as, simply, “typically Irish.” In both its physical design and its application throughout history, tear gas is for the control of economically, politically, and socially vulnerable populations, enforced by mentalities and behaviors of constantly reworked white supremacy. Feigenbaum writes further on analyses and investigations into riot control policing, “police reviews of riot control bracket out both the factors that lead to urban uprisings and the consequences of using a violent force to crush them.” The narrow framework of the debate around police violence and the strategic mindset of corporate American style policing together characterize the vested interest of the power elite in misunderstanding the population and the population misunderstanding itself. Limit the discussion and assume violence as a natural response. Chomsky has observed the preparation of the state to its own neoliberal blow-back, noting that the US-Mexico border was militarized heavily beginning in 1994 because “it was assumed that there would be a flow of people fleeing from Mexico across the border as either a direct, or indirect, result” of strangling Mexico, largely through destroying its agribusiness, by imposing the North Atlantic Free Trade Agreement (NAFTA) (Alternet, Chomsky, Cairns). Feigenbaum continuously points out how state produced conditions lead to state oriented perceptions of increased needs for tear gas, as is the case with “East Africa, Thailand, Indonesia, and the Indian Subcontinent,” where “struggles for democracy, the effects of climate change, and economic austerity fuel conflict in these regions.” Violence is both the problem and solution in such places. 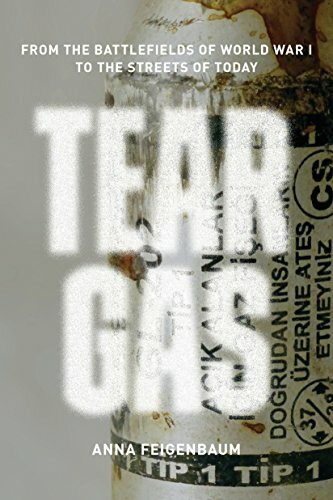 Feigenbaum’s Tear Gas is a groundbreaking work for several reasons, the primary one being its expansion of what is acceptable information and discourse in the debate around tear gas. Feigenbaum’s emphasis on the role of corporate interests and power, the conditions that lead to situations prompting the usage of tear gas, the reproduction of those situations caused by its usage, and the unraveling of public relations and ideological absurdities created and held by the powerful are enough to make the book diversely useful. However, in the coming years, readers may find that the timeliest feature of Feigenbaum’s Tear Gas is its intersectional political analysis of the implications for social movement groups of corporatizing military policing. Social movement groups and actors are who the “tiny elite” need protection from. Feigenbaum’s analysis is intersectional because police brutality’s causes and effects both oppress a wide and diverse range of social movement groups, issues, and struggles. The oppression of police brutality—symbolized by the overwhelming yet elusive design and usage of tear gas—intersects the experiences of the oppressed across issues, tactics, beliefs, and backgrounds. Further, Feigenbaum uses the social movement solidarity of experiencing tear gas to argue for “care for each other” as itself a social movement tactic—the nonviolent movement antithesis to state violence—citing grassroots medical facilities, educational and relationship building mechanisms (often through social media), and international gestures of connection, understanding, and other diverse tactics and events. Feigenbaum illustrates the multi-functional oppression of militarized policing, and herein lies the intersectional nature of her inquiry. The oppression of tear gas is experienced by environmentalists, people of color, the poor, refugees and immigrants, the LGBTQ community, the mentally ill, young people, those protesting police brutality itself, and all those most vulnerable and/or opposed to state violence. Tear gas does not merely symbolize a connection between diverse movement groups; it is a connection. The advancement and protection of corporate interests pervades all walks of life, and the only hope visible within this political and economic structure is for empowered victims from all walks of life to constantly disrupt and replace market violence with intersectional care and creativity—the opposites of violence. The population must insist upon its own, nonviolent tools for understanding and constructing order, those which understand democracy through relationships and not through markets. These tools, rather than protecting the order of profit making at the expense of the social, political, and economic order of the population, would protect the order of the population to the explicit detriment of the order concentrated profit making. The cruel irony of Lewis Powell’s 1971 memorandum to the business community is that in order to solve the versatile, pervasive, constant violence of corporate control, it is indeed the work of the population to “destroy the entire system, both political and economic” if we hope to move past the normalized violence of tear gas. Matthew Vernon Whalan is a journalist and writer whose articles and commentary have been published in Counterpunch, The Berkshire Edge, The Brattleboro Reformer, and other venues.